I've been calling myself a "bibliophile" for a long time now. Books are an unhealthy obsession, and I do mean "unhealthy" literally in this case. I'm known for collecting more of them than I could possibly read in the span of five years (or even a lifetime) and of filling every nook and cranny in my house with books. If I could have a library in my home with floor-to-ceiling book shelves, that would be my dream home. I am obsessed with books, and with the written word. As a child, I read everything that was put in front of me, devouring words as one might gobble up a box full of chocolates (and finding the words just that sweet, as well!). I'll admit: I am a book hoarder. That's what I want to talk to you about. Book hoarding has impacted my life in some meaningful ways, some of them healthy and some of them not so healthy. Now it's time for me to move on, shortly after a tremendous purge brought on by moving house and not being able to take it all with me. These days only a media recluse can avoid having watched one of the hoarding programs on television. We enjoy watching, horrified, as people fight over every little scrap of refuse in their home, rooms piled high with all sorts of junk and trash that the hoarder refuses to rid himself of. Settling in to listen to the story, we hear that the hoarder had some terrible life experience that made them develop an anxiety disorder or obsessive compulsive disorder and the compulsive need to obtain -- and then keep -- things. This modern definition and the so-called mental disorder which has been attached to it have little to do with the original meaning of the term "hoard." A "hoard" is an amassed stash of like items. These items may be neatly stacked and categorized (like an enormous collection) or may be tossed together into a space with little care or consideration for the keeping of the items in the collection. Perhaps the most commonly hoarded items that I have personally heard of or experienced are newspapers, magazines, and books. I've heard various reasons that people hold onto these items, but they are usually kept for their sentimental value or on the premise that having them will allow the hoarder to obtain information "at their fingertips" because the information is contained within the hoard. Hoarding like items is no less devastating than hoarding large amounts of junk. A book hoard, however, consists primarily of books, but may include some newspapers or magazines alongside the books. Some book hoarders have entire rooms full of books stacked on top of one another or tossed together willy-nilly. The hoard is different from the home library in that the books are rarely grouped or categorized and often go unread. For the purposes of this hub, we're talking specifically about hoarding books in large numbers. If you look at the picture above, that's been me in the past. Perhaps not an entire room, but surely an entire wall, or corner, of a large room, filled with books stacked from the floor to the ceiling without organization or consideration for the titles, authors, or genres of the collected stacks of books. At the time that this took place (about eight years ago now) I wasn't reading the books, and I didn't re-sell those books that I'd purchased (read or not) in order to make some money back on them or simply to get them out of the house. The space didn't resemble a library at all. It was an uncomfortable, cramped space that made my brain frenzy every time I looked at it. My hoard made my skin crawl, and I knew that I'd never be able to read as many books as I'd brought home (often free or discounted) from the book store. I cared little for the individual books or for the hoard in general, but heaven forbid you should attempt to take those books away from me! This was in the days before eReaders became popular, and in the days when I had daily access to a hundred or so free books at our local used book store. I loved the books, and I wanted to read every one that I picked up at the book store off that beguiling "free" shelf. My husband and I went nearly every day to pick them up in twos or threes, but often bringing home the store's limit (ranging from 5 to 20 depending on how often we'd been in the store recently, taking as many as we could carry!). The worst part is that I never get rid of books unless they are ruined. Even if they have no value to me, I don't tend to find them new homes. What Defines a Book Hoarder? First of all, I ask that you do your best to set aside preconceived notions about what "hoarding" means. The television shows discussing hoarding as a mental illness address an entirely separate issue. Hoarding does not require a person to be suffering from an anxiety disorder in order to desire to obtain or collect a particular item. A person may hoard virtually anything deemed of value to the collector, and it takes nothing more than excessive collecting to stockpile a "hoard" of items. In fact, extreme couponers who collect large stashes of toilet paper and laundry detergent are "hoarding" these items -- even if they plan to use them. If you think about it, some of these extreme couponers never intend to use everything they purchase and ultimately give some of it away to food banks and other charities. That is what real-world hoarding looks like. By this definition of "hoarding," a book hoarder is someone who collects (obtains) books in large numbers but does not purge the hoard by removing those books which have either been read or never will be read. When I was a teenager working for the first time, I spent nearly every dime I made at Borders Books. As I got older, I became wiser to how I spent my money and began purchasing books from second-hand book stores so that I saved money. The only actual consequence of saving money was being able to purchase more books. This is the cycle that I got into for a long time. The problem wasn't the money spent on books. I never regret the money that I spend on purchasing books for myself. My problem was the fact that I bought books I'd never read and stacked them ten and fifteen books deep on a table, or filled boxes with them, or littered the floors with them because I lacked the space and had no desire to read perhaps 80% of what I read. The desire to have the books was more important than the desire to read the books. That's where my issue lay. But worse than that, I have (to this day) a lot of trouble getting rid of books, regardless of whether or not I have read them or intend to read them in the future. When my family moved recently, I chose about a dozen books to bring with me, and left the rest of them behind for my family to dispose of. Yes, I took the easy way out, but I knew what I had and had chosen to preserve just a few of them to bring with us when we moved. Since then, I have mostly switched to reading on my Kindle Paperwhite. What I would love more than anything else as a bibliophile is to have my own home library. 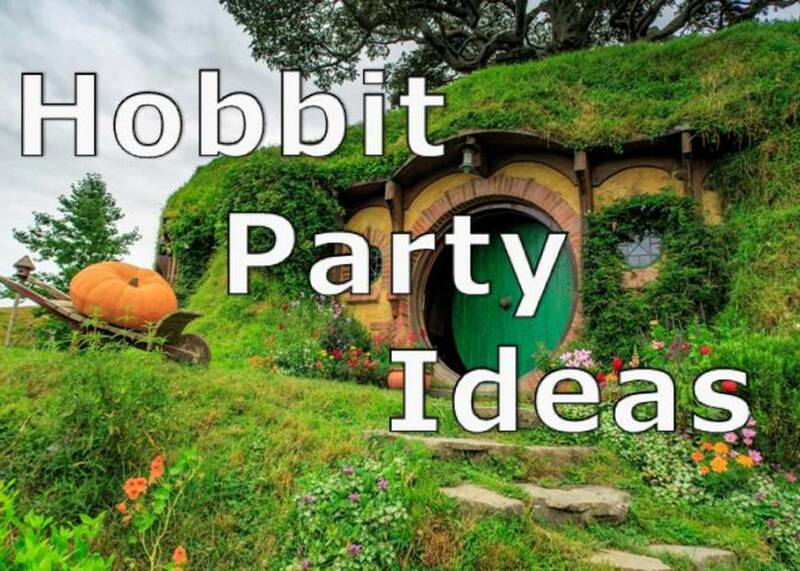 It would be elaborate, with floor-to-ceiling book shelves, all crammed full with books I've read and loved. I'd keep only those books I wanted my family or friends to read, and discard those I'd never finished, never read, or didn't like. 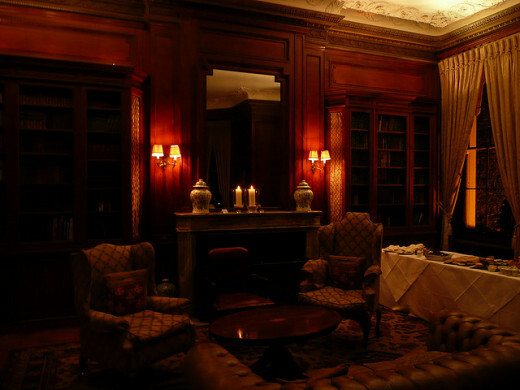 There would be a fireplace in my home library, one that burned wood for the glorious scent that would fill the room. I'd have a cozy easy chair, something comfortable with a throw pillow for my back, and a beautiful, hand-knit afghan (maybe it would have cables. I do so love cables). An end table would sit at my right side for my hot coffee or tea, with an area with a kettle and cups tucked up out of sight in a corner so that I could move it out of the way and wouldn't have to look at it. I'd have a rug of some sort, something heavy so that the floors would stay reasonably warm, heavy curtains on the windows because they are beautiful, but they'd always be open to let in natural light during the day. A chair near the window would be nice, maybe even a window seat so that I could sit in the seat and stare out, dreaming about the characters in the latest book. In my dream library, the books would all be print, hardcovers whenever possible, and in impeccable condition. Nobody would break the spines or damage my books, and I'd be able to read them again or again. Friends and family would always return the books to me when they were done with them. Hey, a girl can dream, can't she? Many bibliophiles find it difficult to purge books. I'm one of those who has held onto too many books for far too long. The books had begun to take over my life and collecting them was a more important hobby than actually reading them. Books can quickly take up space, but there are other unfortunate side-effects to collecting too many unread books. When they sit about, books collect dust and the paper can actually attract bugs. This is less of a concern if you don't already have bugs in your home, but the paper makes a perfect hiding place for pests, and undisturbed books make it easy for insects to hide and make their home. Purging your book collection may have several benefits for you. I know that it has helped me tremendously! It's a healthy part of the reading cycle. Books should be purchased, read, and passed on. If you don't intend to either collect books you've read (to show them off or lend them) or re-read the books, then they should be discarded. It helps to avoid giving pests a home. Insects (including cockroaches) love paper, and mice may use the material to nest in. 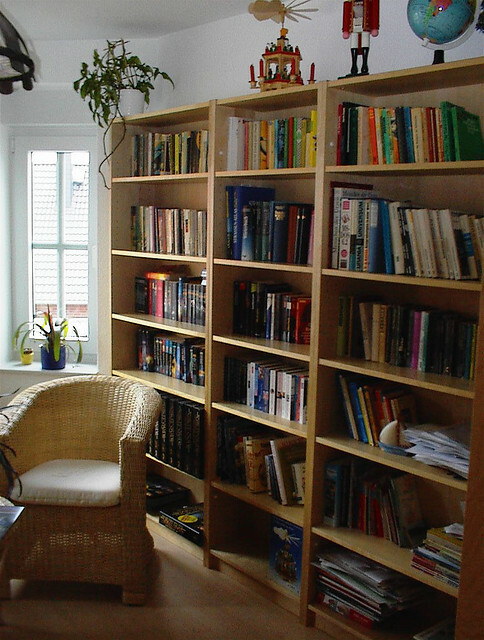 Keeping books -- especially if they sit undisturbed -- may provide pests with a home: Your home. It makes room for new books. 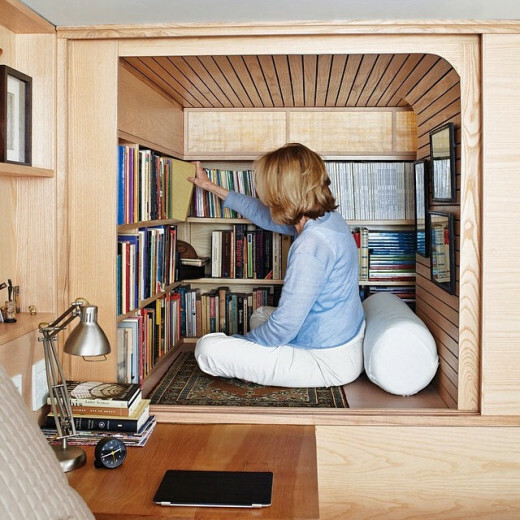 Look at it this way: You probably have limited space in your home for books. If the space is completely filled with books, there's nowhere to put new books. Purging makes room for new books! It can earn you money to spend on more books. If you sell the books you've read either in a garage sale or to a used book store (such as Half Price Books), you will have more money to spend on more books to read. The thought of giving up books I've loved (or even those I haven't read!) is unbearable to me. I struggle with it every time I have print books in the house. Which ones would I keep and which would I "throw away?" It's worse because one common issue adoptees (such as myself!) face is the uncanny ability to apply a personality to inanimate objects. Because I often view things as having a peculiar personhood, I feel the sting of abandoning an item that I've loved. 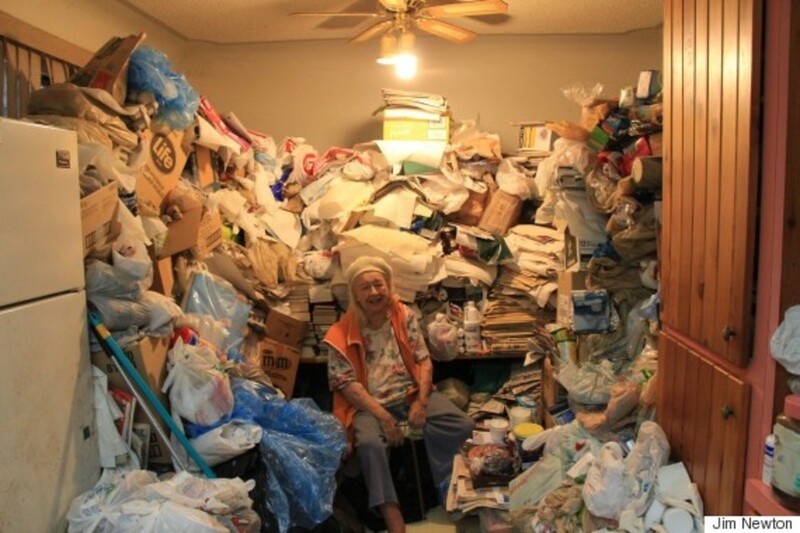 (This is probably a common problem with full-scale hoarders as well). Selecting which things should be discarded and which things should be kept is therefore a painful process. So let us assume for a moment that a book has a personality. It would, therefore, have a singular purpose: To be read. This means that if I am stockpiling unread books, I'm hurting my books by not reading them or allowing someone else to read them. Surprisingly, this actually makes it easier to know what to do with unwanted books during a purge! The most obvious solution to purging books is to sell them. In the United States, Half Price Books is one option, but books may also be sold via Amazon or eBay. You may also choose to donate unread/unwanted books. Goodwill is always willing to take them, and some libraries may also accept donations of previously-read books. 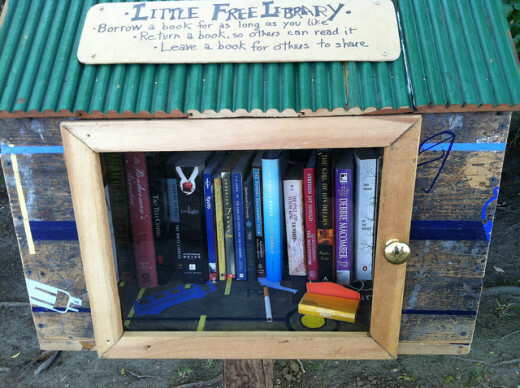 Little Free Libraries are beautiful and fun! Have you ever seen a Little Free Library? I've really only run into them online, but why not make one? Someone will want to read your books! Book Crossing allows you to set your books loose for somebody else to find and to read. How much fun is that! You should check out the Book Crossing Website. If you're not going to read it, don't hoard it. Pass it on to somebody who will read the book so that it can be enjoyed. I had to find a solution to the book hoarding problem. For me, it was to begin reading e-books instead of print books. This way, the majority of my library is being stored remotely on the Amazon cloud, and I can download the book I am currently reading and then remove it from the device when I'm finished with it. This has worked on well for me and has helped to support my reading habit without continued personification of the books I've obtained. Once I've purchased them, there's no "getting rid of the books" because they are on the cloud and can be downloaded again if I want to, but I don't have to have them loaded onto my PC, Kindle, or other device. It winds up working out perfectly for me, and it might wind up being a solution for you, too. I'm currently reading on a Kindle Paperwhite, but I plan on purchasing the new Kindle Voyage as soon as I can afford to do so. You might want to check it out (link to the right) on Amazon to see if it's something that works for you. I love being able to read any time, anywhere, but truly the main benefit of the Kindle is, for me, that I don't have to worry about a hoard of books and "disappointing" them by not reading them! Yes, I do. I have a lot of books I've never read and will never read. Yes, I do, but I plan on reading all the books that I have. I guess I'm a "collector" more than a "hoarder." Yes, I do, but I regularly purge the books in my hoard so that I'm never overwhelmed. No, I don't. I read books and then discard, sell, or donate them. No, I don't. I read books on an eReader instead of purchasing print books. What About You? Are You a Book Hoarder? Now that I've told you my story, some of you probably think that I've lost my marbles and am the type of crazy person you see on those television shows (I'm not: I purge my home regularly now and find it much easier to get rid of anything unwanted -- except for books! ), it's your turn. Do you think that you hoard books? There's a poll to the right that you can take (anonymously!) to say where you think you fit, or you can comment in the comments below. I'd love to hear some of your book-hoarding stories, so go ahead and fill me in! 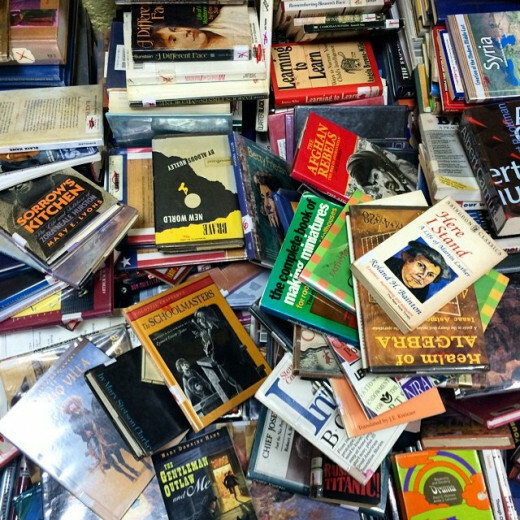 Do you hoard books, or do you keep just enough to satisfy you? 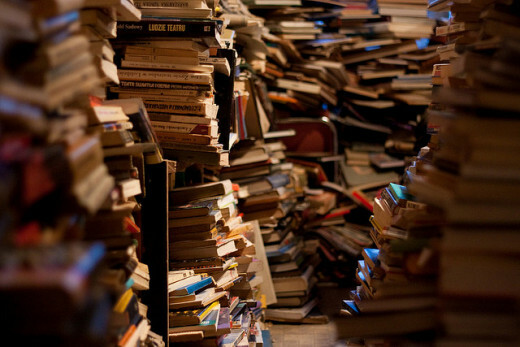 If you keep books, are you a collector or a hoarder? How has book hoarding impacted your life? I purchased my Kindle Paperwhite over a year ago and have read dozens of books on the device. It's one of the best purchases I've made as a reader and I believe others could benefit from owning one. I have tons of books, too. I tend to regard them as pseudo children, and therefore, take very good care of them. I have donated some to libraries and sold some at yard sales, but later wished I had them back. I buy fewer real books now that I read on a Nook e-reader. Still, there are some cases where only a real book will suit me.